The St. Katharine Drexel Legion of Mary welcomes all to join them on Wednesday from 11:00 AM – Noon at the SKD Mission Office. 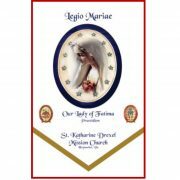 The Legion of Mary is the largest Confraternity of men and women worldwide practicing Marion devotion through Apostolic spiritual and corporal works of mercy. Lent begins Wednesday, March 6, 2019. Did you know that 25% of CRS Rice Bowl donations stay in our local communities? CRS engages people at every level—individual, family, community, regional, national and international—to promote transformative and sustainable change by providing health and medical services, clean water and sanitation, justice and peacebuilding, and working with at risk families displaced from war ravaged countries. CRS Rice Bowl is our sacrifice. 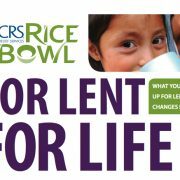 CRS Lenten Rice Bowls will be available before Ash Wednesday to Religious Education classes and available to parishioners who wish to participate. *Note: For the Religious Education class returning the most Rice Bowls there will be a class surprise!